SELFEYE | What Does SELFEYE Mean? SELFEYE means "Eye Selfie". A SELFEYE is a SELFIE of just the eye. Many popular celebrities and makeup gurus post SELFEYES on social-media networks (usually Instagram) to show off their eye makeup or eyebrows. The term SELFEYE is attributed to the makeup brand Max Factor, which coined the term to promote their new mascara. SELFEYE is a portmanteau word formed from "selfie" and "eye." Person A: I'm about to get my eyebrows threaded for the first time. Person B: Be sure to take a SELFEYE to show off your new brows! 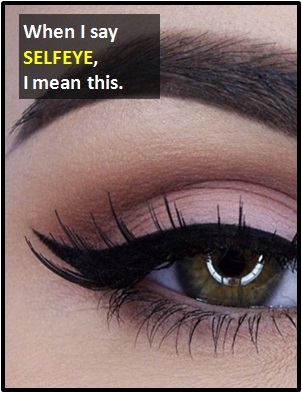 The term SELFEYE is an amalgam of the words and "selfie" and "eye."